“What’s with the title?” people often ask. Well, it’s like this. On a golden summer morning in 2010, I received a diagnosis that upended my life. Three months to the day later, my college roommate got a similar phone call. Eventually, I landed in a clinical trial on the cutting edge of cancer treatment, using the still developing science of immunotherapy. My friend went through the more traditional route of multiple surgeries and chemo. And here’s what I’ve learned. Cancer is not a battle. There are no winners or losers. We’re all just human, trying to get a little more time here so we can love each other a little longer. And sometimes that’s terrible and sometimes it’s beautiful. So that’s what’s with the title. I would never have volunteered for a front row seat for the biggest breakthrough in cancer of our time, but here I am anyway. The potential for both destruction and healing within our own bodies is fascinating. And it feels like the greatest privilege in the world to have the opportunity to talk about it, from the perspective of someone who failed one semester of high school chemistry. 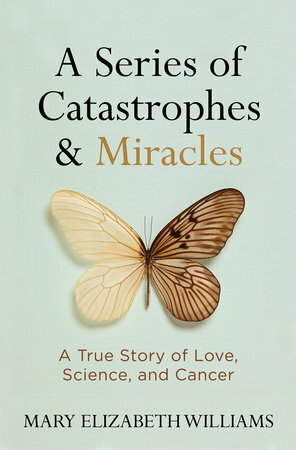 Part memoir, part behind the scenes look at the new world of scientific research, A Series of Catastrophes & Miracles is published by National Geographic Books. You can of course find the book through all your favorite retail options, including Amazon and B&N. If you are interested in ordering the book for your classroom, work group, or corporate event, please contact Special Sales at National Geographic: specialsales@natgeo.com. Interested in having me visit your group to continue the conversation? Let’s talk. My first book was published in 2009 by Simon & Schuster. My middle class family spent three years chasing the American dream of home ownership. In New York City. At the height of the subprime mortgage bubble. The book remains one of the first firsthand accounts of the tulip fever-like circumstances that led to the 2008 crash, and I learned a great deal along the way.